Thy Kingdom Come: Christians around the world praying for more people to come to know Jesus. Promoted by Archbishop Justin Welby, the programme of prayer meetings, walks and other events is especially focused on the period between Ascension Day (25 May) and Pentecost Sunday (4 June). For us in Christ Church, this is the perfect lead-in to Loved for Life, a series of outreach events in June coinciding with our 40th anniversary. Several sessions are happening in Christ Church. 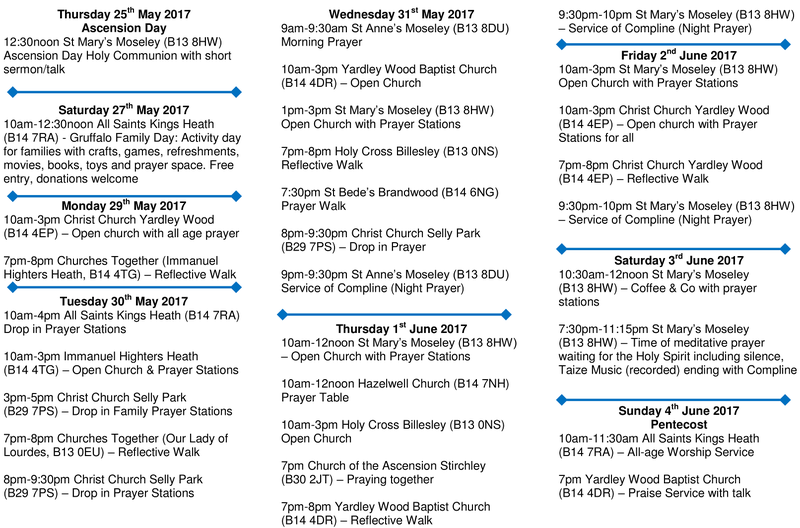 We’re also pleased to announce some prayer events hosted by our friends and neighbours at Selly Park Baptist Church. In addition, we will hold a prayer walk after the morning service on Sunday 4 June – Pentecost Sunday. A programme of events across local churches is shown below, and can be downloaded in printable form using the link on the right.